This is the first in what will eventually be a 3 part series exploiting the “Route Next Hop By Calling Party” feature in Communications Manager. In a globalized dial plan, your goal is to convert user dialed numbers into a globally recognized e.164 format for best match routing. The issue we run into in the US, especially in lower density areas, is the fact that numbers within the same area code can be treated as local or long distance and require different routing and number presentation for each. The problem would be simple if a 7 digit call to a long distance number simply failed, but more often call setup succeeds just fine to the error message place telling you to “dial 1 then the area code before dialing this number.” In the old days this means that we either have to simply pass the 7 digit number to the PSTN without any dial plan features, or maintaining huge route filters of local patterns so that they can be presented different based on the local gateway. With the addition of the “Route Next Hop By Calling Party” feature, we can now create a secondary lookup on these number while letting the user decide what patterns actually egresses the gateway. For this we we need to create 2 new calling search spaces. 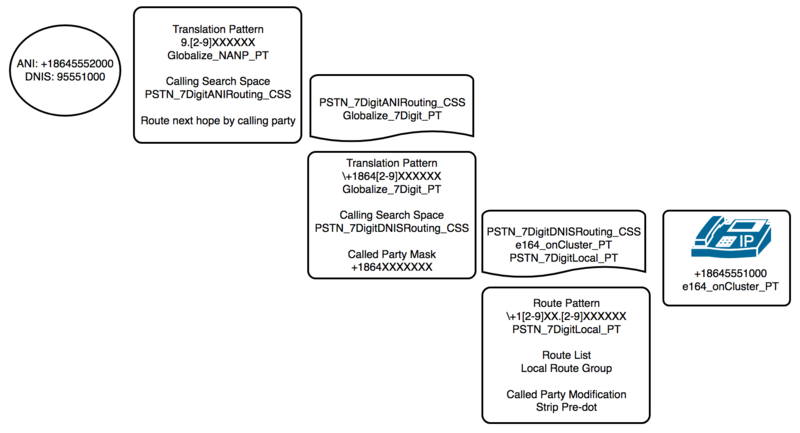 One that will house our “ANI” based routing patterns – PSTN_7DigitANIRouting_CSS and then a special search space to catch the pattern and route it to the PSTN – PSTN_7DigitDNISRouting_CSS. First we will create a Translation Profile to “catch” the dialed number and select the “Route Next Hop By Calling Party” option and steer it to our first calling search space. No other modification is needed. The purpose of the Globalize_7Digit_PT is to match our calling party and prepend the same area code to the DNIS to create the globalized number for routing. Once the number is in our globally recognized format we can route it through any of our special routing processes where we might want to adjust or simply match patterns for on-net calls. Our last partition in the PSTN_7DigitDNISRouting_CSS is where we will steer the call to a special Route Pattern to strip the number back to 7 digits and we use the Local Route Group to pass this out the gateway we want.